There have been cases where an ENT (Ear, Nose and Throat) doctor has noticed polyps and suggested that the person be tested for CF because polyps are so profound in people with CF. Then they tested positive for CF. It is interesting how different signs/symptoms are prominent in some and nearly undetectable in others. The reason for that is that CF is very unpredictable. 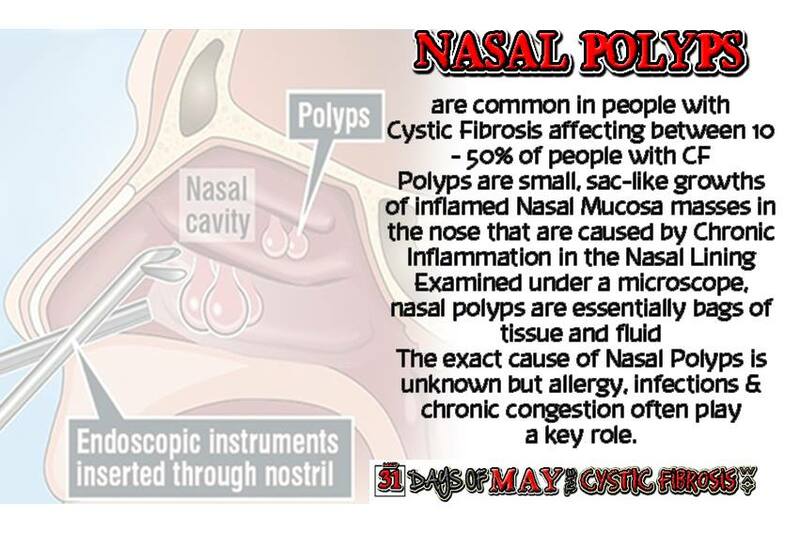 Below are some images to help you understand nasal polyps and what they are all about. Polyps cause facial pain, headaches, sinus pressure, clogged nose (unable to breathe through your nose or even blow it). Sinus rinses are a common thing in people with CF. I’m sure you have heard of the Neli Med sinus rinse that many doctors tell you to use when you have a sinus cold to help flush out the junk. CFers use the salt sinus rinses as a maintenance thing to keep things moving. Since our mucus is so thick and sticky it gets clogged everywhere in our bodies especially in the sinuses. We have to stay on top of it to help keep things moving. When I started doing sinus rinses it was before these fancy sinus rinse packets and bottles or Nedi pot. I had to make my own solution with canning salt and boil it and let it cool then fill a jug of it to have on stand by. The irrigator was a bulb type syringe (looked like a blood pressure cuff bulb and tube) with a tube on the bottom and a tube on the top. The bottom tube went in the water-salt solution, you squeezed the bulb and it sucked the water up and then another pump made the water come out the top tube that you put in your nose to flush your sinuses. Sounds complicated and it was. It clogged all the time. Needless to say I was very happy when they invented something much more user friendly. 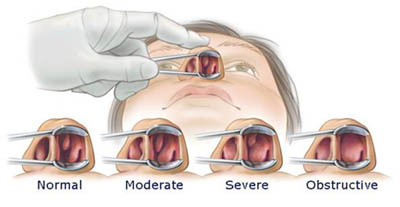 My first sinus surgery was in 1990 and my last sinus surgery was in 2001. I did average 1 a year for what seemed like forever. I hope to not ever need another one but only time will tell. That may be wishful thinking.